A study which lasted years, and involved some extremely close encounters, has shed light on the female migratory pattern of the fiercest predator in our waters. For the first time researchers tracked several female sharks from specific great white populations (Carcharodon carcharias) off the coast of Mexico over a three year period instead of just several months by attaching tracking equipment to the species’ dorsal fins in order to gain an insight into their breeding cycles. Their findings revealed the sharks have widely separated mating and nursery areas, posing fresh issues for efforts to protect the species. Despite their legendary status as so-called killing machines, great whites are actually elusive and scientists say relatively little is known about the species. Their fearsome reputation was clinched after the 1970s Hollywood film, Jaws. 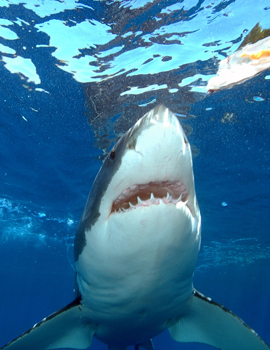 Since then great whites have earned the synonyms “man-eater” and “white death”. Great White Sharks are highly adapted predators and their mouths are lined with up to 300-serrated triangular teeth arranged in several rows. They have exceptional smell and also have organs that can sense tiny electromagnetic fields generated by other animals. Their numbers are decreasing and there is no reliable data on current populations, so new information on breeding cycles has caused excitement among marine conservationists. The study revealed that females have a two-year migration and breeding cycle with four distinct phases. Firstly pregnant females left Guadalupe Island off the coast of Mexico and remained offshore for most of their 18-month gestation (on average 465 days). This open water area was much larger than the foraging area used by males and females tended to avoid the males’ foraging area while the males were present. The sharks behave aggressively during mating, and afterwards the females deliberately avoid the males. The second phase was a two-month sojourn in the coastal waters of Baja in California where the sharks gave birth. But here the females not only put themselves at risk of running into shipping traffic on their journey along the shore but also put the lives of their pups at risk too which has raised conservation concerns. Once the young sharks are born the females leave the nurseries and return to Guadalupe Island in such a way as to avoid males until they are ready to reproduce. Finally the mating phase at Guadalupe Island was found to last up to four and a half months before the two year cycle began again. Females that skipped a year of reproduction returned to the breeding site after only a single year migration. Dr Domeier president of the Marine Conservation Science Institute said: “Our tracking has highlighted a previously unknown period of vulnerability when the females are exposed to commercial fishing off the coast of North America.” Overfishing is one of the major threats to this species which is listed as endangered.